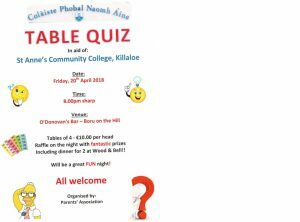 The Parents Association are holding their annual Table Quiz on April 20th in O Donovan’s bar – Boru on the Hill at 8pm. Tables of 4 are €10 per head with fantastic prizes on the night. Raffle prizes on the night include dinner for 2 at Wood & Bell as well as other great prizes. It promises to be a fun night and all money raised will go to projects in the school. By killaloeteacher in Other on April 11, 2018 .